The Fountain of Youth has been around for centuries, right underneath our noses and available inside our homes! That's right, it's plain and pure water. There are no medicines or creams that will make you look younger, prevent rapid aging or help you feel great and healthy like drinking sufficient quantities of water. 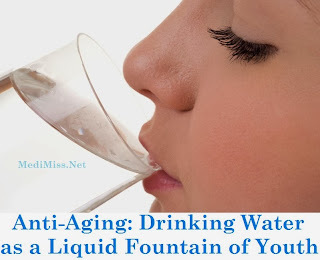 To learn more about why and how water can slow down the aging process and keep you feeling refreshed, along with a breakdown of exactly how much water you should be getting a day, keep reading. Water makes up between 55 to 78 percent of our bodies. That means over half of every person is made out water, meaning it's absolutely crucial to our survival and health. Since our body depends so much on water, we have to feed its need. Many of us are drinking soda, coffee, energy drinks or tea, but we're simply not hydrating ourselves properly with water. While these drinks do have water in them, the delivery of that hydration is impeded by diuretics such as caffeine or propellants like sugars. By consuming water, we are purifying our body, inside and out. One of water's best functions is as a lubricant for our digestive system, flushing out toxins and giving our colons the hydration they need to function properly. Simply drinking the right amount of water every day will not only keep you feeling healthy, but it will also get your metabolism working faster and your body burning calories quicker. That results in weight loss and is a great way to defy the aging process. The purification properties of water also help to cleanse the skin. Many people spend hundreds of dollars on face cleanser while drinking water is the higher priority to give you blemish-free, fresh and young-looking skin. All of your skin cells need to be hydrated and the best way to do this isn't through a $75 bottle of moisturizer, but by drinking a free glass of water. That hydration will promote the growth of collagen, boost elastin production, increase the flow of oxygen to the upper epidermis and help your skin cells rejuvenate faster. That regeneration is what will keep your skin looking young and healthy. You should be drinking at least 8 glasses or two liters of water a day. People over 200 pounds should increase that amount by half a liter for every 20 pounds. If you're exercising, exerting yourself or spending a significant amount of time in the heat, you should increase your water intake by at least 50 percent for every hour. Depending on one's locale, people are concerned about the pollutant properties that come packaged in regular tap water - and with good reason. There are, however, a few alternatives to help combat that concern - such as spring water, mineral water, filtered water, and distilled water. However given the critical importance of daily hydration, find a source of refreshing and affordable drinking water that you can and will consume.